Fissure 8 is still emitting a gas plume, and lava circulates weakly within the cone. Residual lava is still draining into the ocean near Pohoiki. 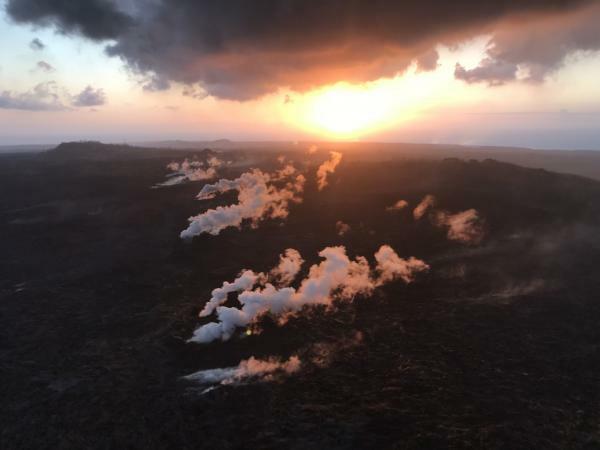 Gas emissions at the summit, Pu’u O’o, and even the Lower East Rift Zone are low. Here’s Mick’s observations from this flight. Thusday, Aug 9, 2018, 6:00 am – Kilauea's lower east rift zone overflight: A view looking down into fissure 8, and a shrinking lava pond within. They also took a quick trek up to Puʻu ʻŌʻō! 11 more photos in this album here. Other videos/photos posted by Mick and Bruce earlier this week: August 9 overflight video, and 55 photos from Paradise Helicopters’ August 1 animal rescue mission (i.e. airlifting cattle over a lava river). See also morning and evening overflight views today of delta and new shoreline posted by photographer Scott Wilson on Facebook. BIVN: “Mauna Loa Brush Fire 80 Percent Contained” That’s from today (August 13). See also Aug. 9 article on beginning of fire. Not-so-local-Mashable posted a good article on how Fissure 8 will be named, giving an account of how Puʻu ʻŌʻō was named (which was somewhat controversial, so it’s be done differently this time). Dispatches from Volcano posted a nice annotated aerial photo of Kilauea’s new summit (with wildfire going in the background), a few observations on seismicity and fresh views into Fissure 8 on Thursday, and photos from various webcams on Friday (Aug 10). Also, reminding us that this eruption is not over, he linked to the USGS/HVO wrap-up report on the 1955 Kapoho Eruption, from which we may be able to draw some lessons (including the “pauses”. USGS: It’s a maximum of 5.5 cm (~2.2 in) near the crater, and thins as you move toward the edges of the ashy area. USGS: It’s the entire depression within the caldera. Halema’uma’u has changed size in the past as well, but it’s still kept the same name. It would be too complicated to start referring to all the past crater outlines by separate names, especially since they’ve been covered up by lava! USGS: There could be a larger lava lake, yes. However, the size of the lake doesn’t necessarily control the size or duration of the eruptions in the Rift Zone. The lava lake is just the very tip of the conduit – there’s much more magma in Kilauea’s shallow storage. Q: Is it true that most of the gas emissions are water vapor? USGS: We’ve been thinking a lot about that and it could simply be that the system backed up a little bit as the eruption began waning in the LERZ. No firm conclusions have been made yet. USGS: SO2 emissions from the summit, Pu῾u ῾Ō῾ō , and the Lower East Rift Zone are all at low levels. LERZ emissions on August 5-6 were ~ 200 tons/day; Pu῾u ῾Ō῾ō emissions on August 6-7 were 200-300 tons/day, and Summit emissions when last measured on July 19 were around 100 tons/day. This SO2 release represents the lowest SO2 emitted from Kīlauea for over a decade. USGS: We understand your concern. The overall output of SO2 from the volcano is very low. SO2 is released from magma when it is very close to or erupting from the ground surface, this is why current emissions are so low. There is no magma near the surface at the summit right now. So even though we’ve not been able to get instruments out to measure since July 19, there would be other signs of magma movement to the surface like earthquakes and ground deformation. (Mia Henry – yes, the emissions do indicate change) We are cross correlating many data streams and will get more gas measurements as soon as winds permit. We remain very committed to ensuring people are made aware of volcanic hazards. USGS: We did see emissions at Pu’u ‘O’o start up again after several months of very little activity, but the levels (200-300 tons/day) are still quite low. Overall, emissions at the volcano as a whole are the lowest they have been in a decade. While this might imply that magma is being prevented from degassing freely, it may also reflect a decrease in magma supply to the system. That’s why we combine our gas monitoring with the seismic and deformation measurements, so we’re not relying on any one indicator. At the moment, all is quiet, but we’re keeping a close eye on things just the same! USGS: It’s absolutely beneficial to monitor gas levels as often as possible, but it’s not our only indicator of renewed activity. We are also carefully watching the seismicity (which would indicate magma movement) as well as deformation (which would indicate an influx of new magma). At the moment, our ground crews in Puna (who wear gas badges) have detected very little sulfur dioxide anywhere in the fissured area. Sulfur does indeed leave yellow deposits, but in this eruption it’s been more commonly observed in spots where the gases are decreasing in temperature. That allows the native sulfur to sublimate on the surrounding rocks rather than escape directly to the atmosphere as sulfur gas. USGS: Magma needs to be very near the surface in order to outgass SO2. There’s just not much near the ground in the LERZ anymore that has a lot of SO2 left in it. USGS: There has been some subsidence, but it’s because the earthquakes at the summit caused the fill beneath the road to settle (and in a couple of cases fall into old lava tubes). It’s an engineering issue rather than significant fault movement. USGS: We’re limiting the number of staff who are allowed to visit HVO, and their mission in the past weeks has been to move as much equipment and gear out of the observatory as possible. It’s been rough for HVO’s scientists who have had to leave their professional home, and we prefer not to spend a lot of time showing off the damage to the building. USGS: The hurricane passed south of the island without making landfall, and there were no serious weather effects. Our field crews reported the expected rain and wind before they paused operations on Wednesday. USGS: We generally don’t comment on data that’s still being reviewed. At the moment, we’re treating this as a pause for safety’s sake – given how fast fissures opened and inundated properties at the beginning of the eruption, we don’t want to give the all-clear too early. USGS: In 1955, two pauses of 5 and 16 days occurred during that 88-day-long LERZ eruption. This could be a pause, or, it’s also possible that the slowdown reflects the end of the eruption. It’ll take days, possibly weeks, to determine with certainty. USGS: Because past eruptions have had pauses, we would want to see a pretty long period where there was no significant seismicity at the summit or in the LERZ, no more deformation indicating magma movement, less SO2 output, and no more collapse or explosive summit activity. USGS: That’s a question we’re still working out. The collapse was driving pulses of magma downrift, but it was ultimately a response to the draining of magma from the summit (not the other way around). USGS: In some cases, it’s due to magma supply at the eruption site. For example, the summit didn’t necessarily drain everything all the way down the East Rift Zone all at once, which could mean that some magma is still moving through the system and has yet to erupt. USGS: Blockages in the system could also cause a pause, like clogging a pipe. Unfortunately, we can’t see underground, so we don’t know if it’s either of those things – or neither. USGS: We use three main monitoring sources: gas type (more SO2), earthquake locations (magma cracks rock when it moves through a volcano), and deformation (the summit changes shape when magma inflates it). USGS: Blockages would probably show up more in deformation than they would in seismicity. Much of the seismicity in the lower East Rift Zone was due to migrating lava cracking rock as it opened pathways for flow; once flow paths were established, seismicity decreased. USGS: Actually, we don’t have any tiltmeters in the lower East Rift Zone. Prior to the eruption, what few tiltmeters we had were vandalized, and since installation of tiltmeters is not an easy task, we were not able to install any around the eruption site. Instead, we monitor the lower East Rift Zone with a combination of GPS (available on the monitoring site) and satellite radar. Neither dataset shows any inflation in the area of the fissure system. USGS: The lava pond may be at a depth near the pre-eruption ground surface – we are working on some models this weekend. USGS: The UAS Team also did a thermal overflight and some of the “red” is residual heat from the hot magma fountains. USGS: There are cracks, holes, small lava cones, and in some places sulfur deposits. The fissures themselves usually have some kind of pile-up of lava around them. USGS: That’s a question of lava supply to the flow front, and how long it lasts now that fissure 8 is inactive – or, if other fissures reactivate. Beyond that, we really can’t say. USGS: Yes. There really has been a lot. Think about how long the entry at Kapoho was active even after lava channel moving to the north around Kapoho Crater was diverted to the west side of the crater. USGS: The trade winds and longshore current are currently pushing the sand and rock fragments slowly toward the southwest. That's within the possible behavior of a fissure, yes, but it could also just resume the activity we've seen in previous weeks (lava flowing into a channel). Absolutely we did. It's pretty accurate! USGS: While tides may have a very minor effect on seismicity, the phases of the moon are a purely visual phenomenon and have zero influence on eruptions. There is currently no sign of significant inflation or deflation in any part of Kilauea’s plumbing system, and we do not expect to see any explosive activity on the rift. Fissures, while they can fountain, are not explosive, and the explosions that have occurred at the coastline are due to the interaction of very hot lava with cold seawater. 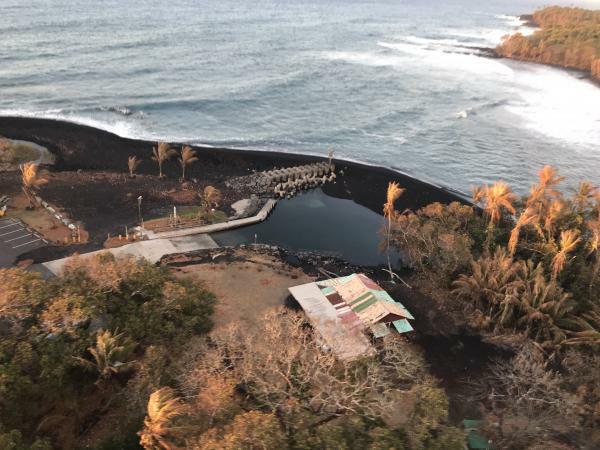 Sadly, the third photo in that batch clearly shows the footprint of John & David’s burned house (the lava rooster house) next to the cell tower. Aloha kakahiaka!! Fissure 8 is no longer effusing lava, and activity at the ocean entry is waning… for how long, only time will tell. For now though, Pohoiki is safe! This image was taken on July 8th, as the 2 mile wide flow front poured into the sea, reshaping the new Kapoho coastline. As heartbreaking as the destruction has been, witnessing our planet’s creativity has been enthralling. Mahalo ke Akua, and prayers and blessings to all those affected. Mahalo nui @ParadiseHelicopters !! @hotseathawaii . . . .